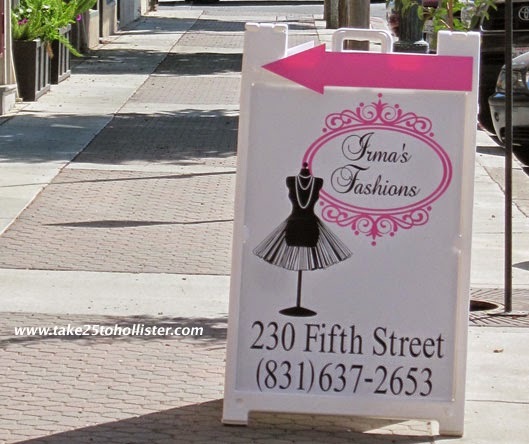 On the southwest corner of Fourth and East Streets are two fun shops. One is Bill's Bullpen that has the latest sports cards, comic books, sports memorabilia, and other sweet stuff. 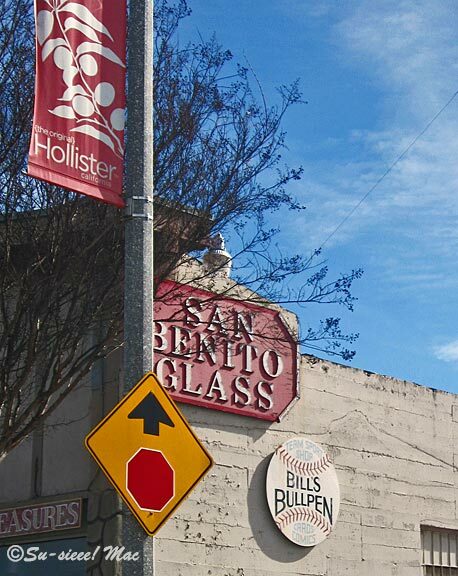 Next door is San Benito Glass that offers glass repair and installation, as well as a wide array of antiques for sale. 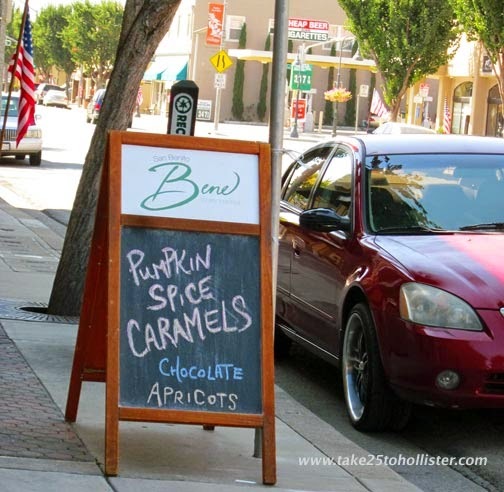 Stop and see for yourself when you're in downtown Hollister. Shades of Twilight Zone. 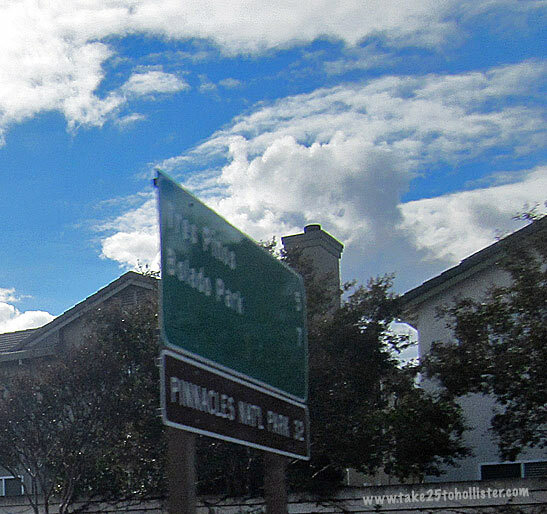 Those clouds are passing through the sign! FYI: I did not do any editing in Photoshop. Well, except to sharpen the photo. 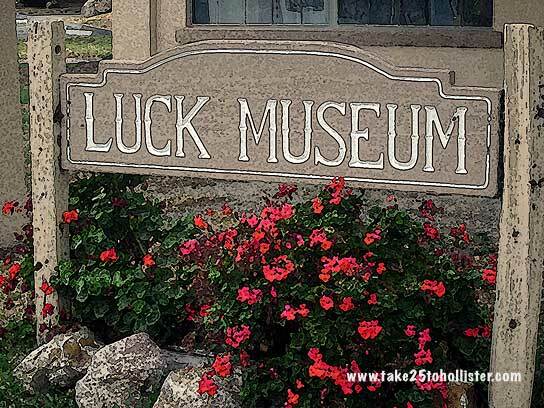 The Luck Museum, more formally known as the San Juan Bautista Historical Society Luck Museum, stands at the corner of Monterey and Third Streets in San Juan Bautista. The museum is open by appointment. 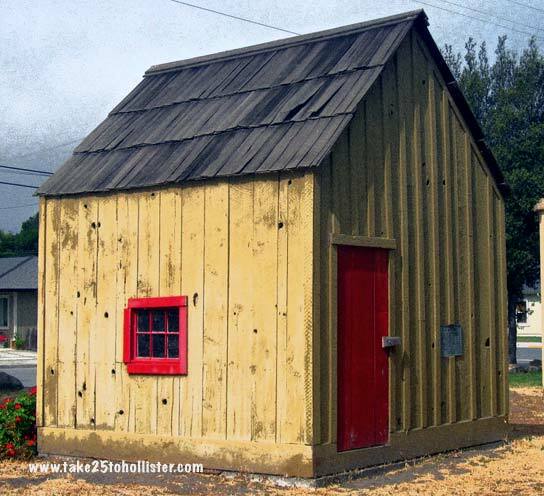 Check out the San Juan Bautista Historical Society website for contact information. 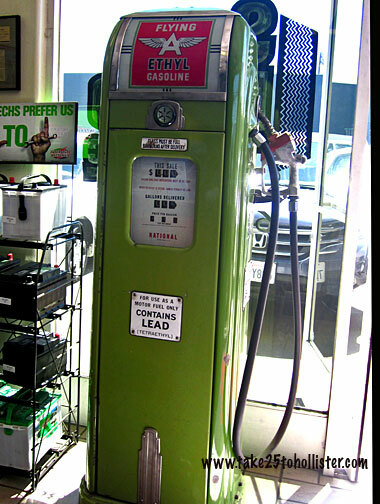 The museum was originally a gas station owned by Carl Martin Luck. The building and the grounds, which is today the Carl Martin Luck Memorial Park was donated to San Juan Bautista by Franchesca Luck, his daughter, in 1974. The historical society plans to restore the building to its original 1930s design. For more about the museum, check out this article recently published in the Mission Village Voice. 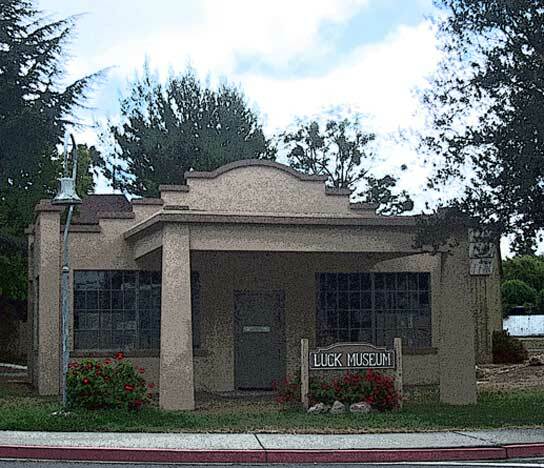 During the late 19th Century, a Chinese man named Jim Jack lived in the one-room cabin that stands behind the Luck Museum. 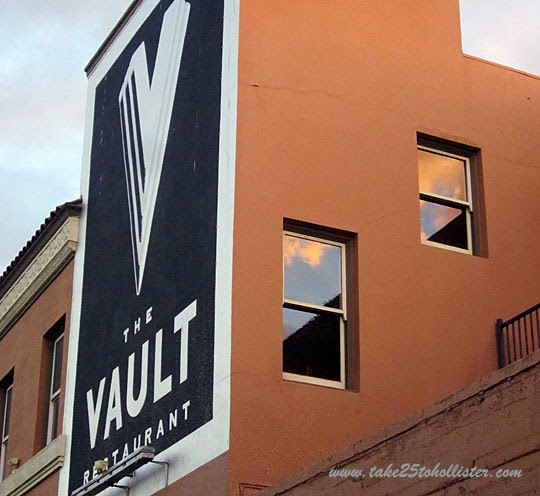 Its original location was on Mission Vineyard. Jim Jack was known as The Mustard King for his work of clearing wild mustard from the grain fields in San Juan Valley and selling the mustard seeds to French mustard manufacturers for big money. 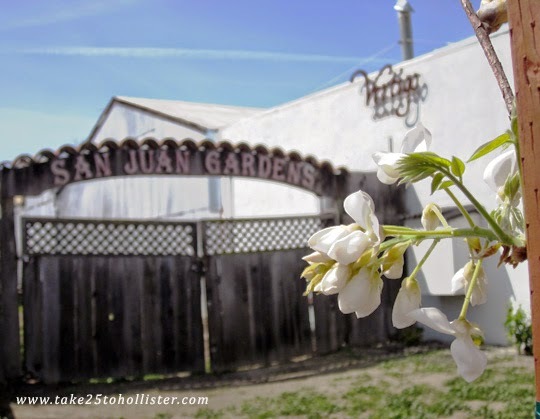 According to the stories I've read, Jim Jack was a generous man who bought flour, potatoes, and other provisions to give away to people in need in San Juan Bautista. He also bought many bags of candy that he gave to children. To learn more about the man, check out this article by Martin Cheek in The Gilroy Dispatch, as well as the story on page 2 in the September 2011 San Juan Bautista Historical newsletter. 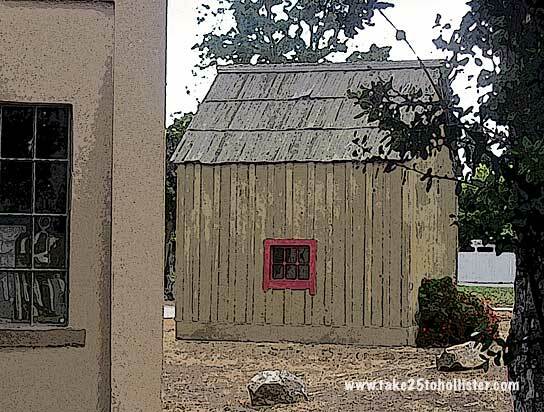 Jim Jack's Cabin in the Carl Martin Luck Memorial Park. Click went the camera. This time the photo was the San Benito County logo on a bright red and white county truck. Until the other day, I was never curious about the logo. 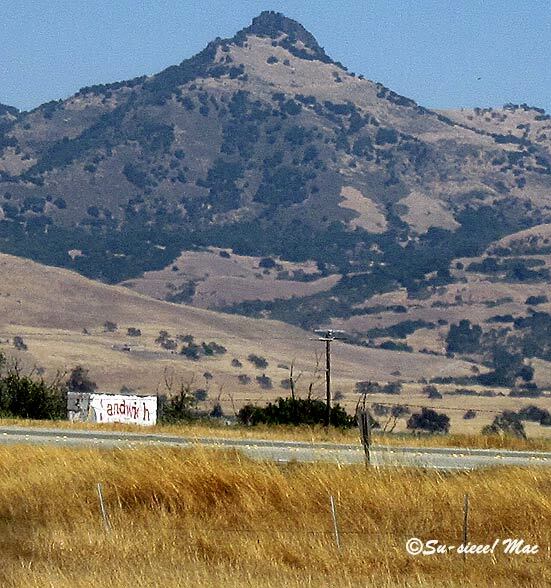 So, what does it tell the world about San Benito County? For one thing, that San Benito became a California county in 1874. Did you know that before then, most of our area was part of Monterey County? And what are our big deals? The logo shows the Pinnacles, Mission San Juan Bautista, and a map of the county, with a star for Hollister, the county seat. Definitely right on. For more about San Benito County, check out its website. Lots of good stuff there. By the way, the map is painted yellow on the logo at the website. Looks good. The high cost of gas, that's what's P.U.! It's summer so, of course, prices are climbing again. Today, the lowest prices range from $3.27 to $3.69. Heaven only knows what it shall be tomorrow. 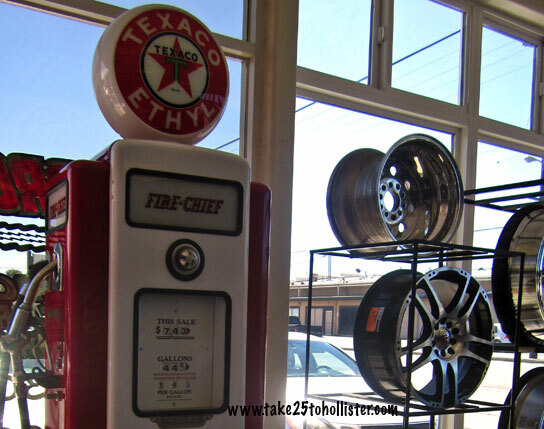 It was a treat to see a few vintage gas pumps in San Benito Tire Pros & Automotive on Nash Road the other day, which once upon a time was a gas station. 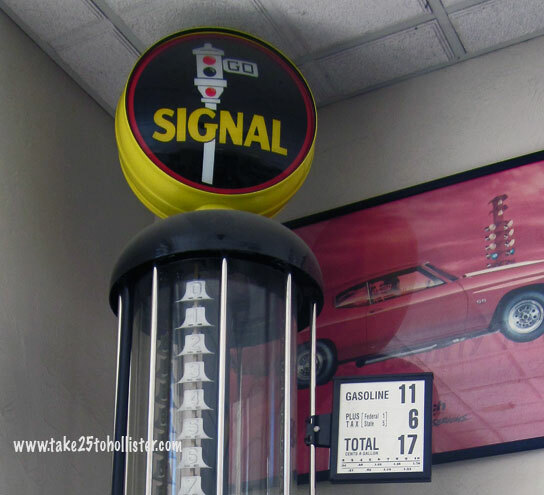 Ah, the old days when you pulled into a gas station and someone immediately came out to pump the gas, check the level of the brake fluid, and wash your front and back windows. And, if you asked, he would check the air in your tires. All that service whether you were there for a full or partial tank of gasoline. 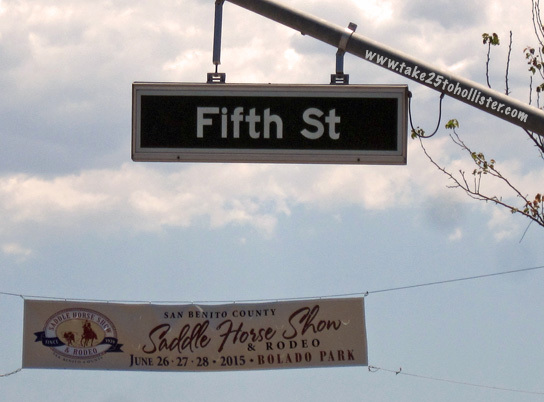 A banner announcing a big-time coming event above San Benito Street is one of the things that reminds me, again, how Hollister is a friendly, sweet, and inviting community. 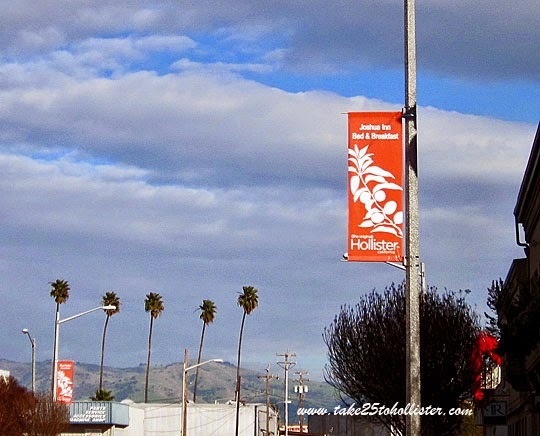 I like how the orange banners are a bright pop of color in Downtown Hollister. How about you? 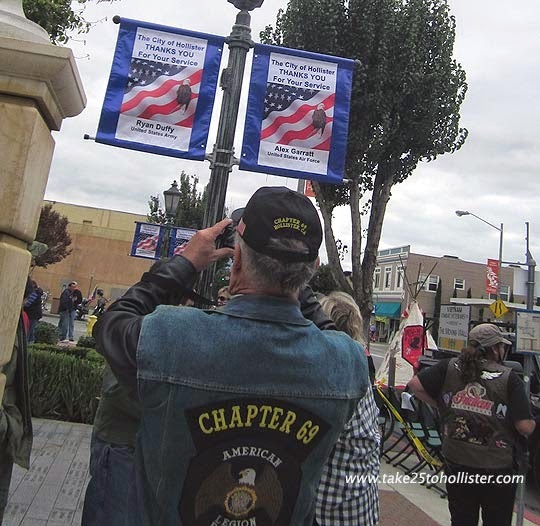 The Hollister Downtown Association is responsible for their creation and posting them up. If you look closely, you'll see a name of a Hollister business on each flag. You can also see the HDA's logo—(The Original™) Hollister California. When the HDA's logo first came out, I thought that it was weird to see the parenthetical original. Is it suppose to be a whisper? "Ssssh. We're Hollister California, not that fake place that's plastered on clothing. Ssssh." Today, I read the parenthetical original differently. 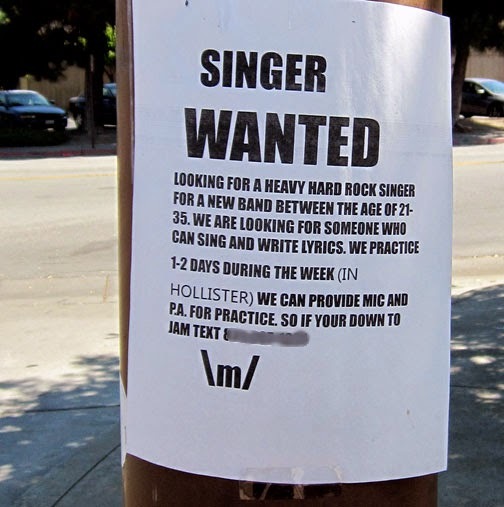 It's more like "We are the one and only Hollister, California!" Yup. 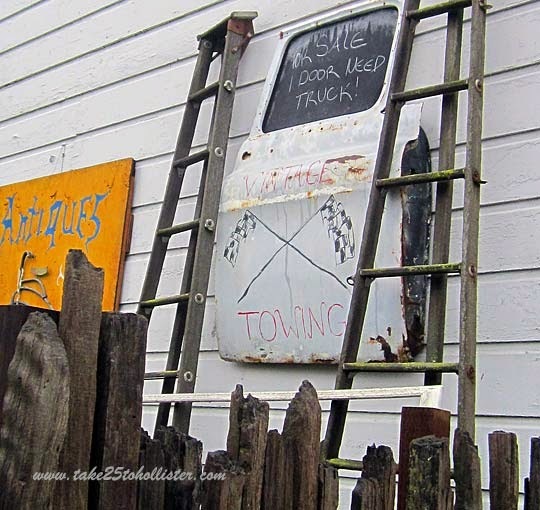 If you like shopping for antiques and collectibles, then stop by San Juan Bautista, about seven miles west of Hollister. That's where this collectible -- or antique -- door is hanging. Today is Our World Tuesday. 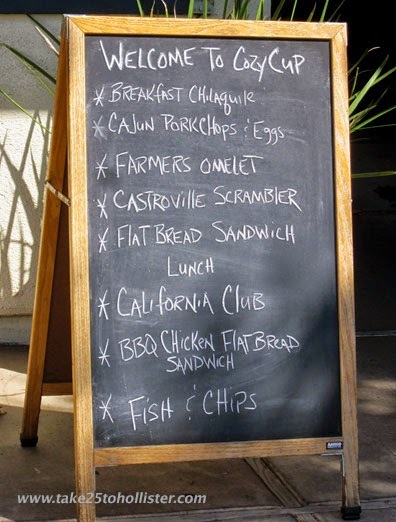 Click here to see what bloggers around the world are sharing about their neck of the woods. 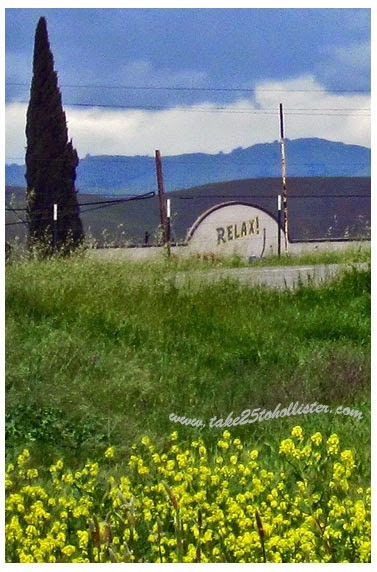 About seven miles west of Hollister is the second biggest city in San Benito County -- San Juan Bautista. In 2013, the U.S. Census estimated its population to be 1,922. 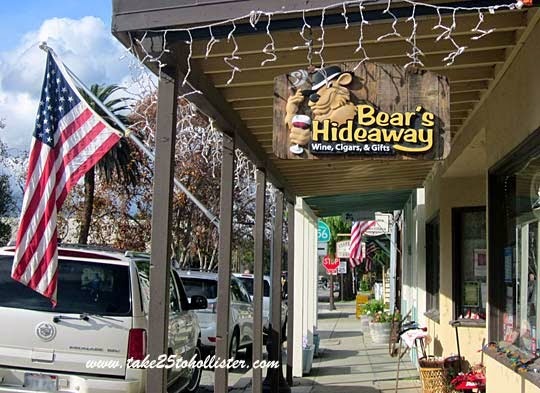 It's a quaint town to wander around, especially if you're into exploring California history. The city was named after Mission San Juan Bautista, the fifteenth in the chain of 21 missions that the Spanish Franciscan friars built between San Diego and Sonoma. 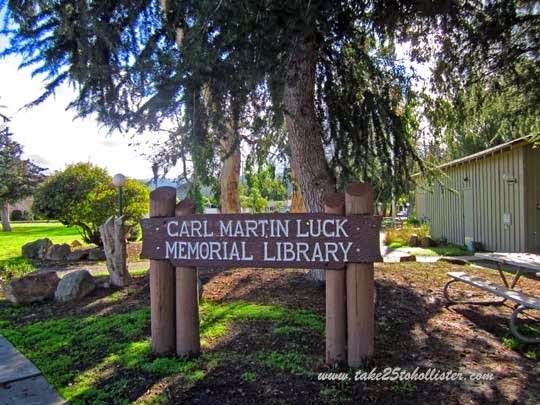 The grounds of Carl Martin Luck Memorial Library and the adjoining Carl Martin Luck Museum and Carl Martin Luck Memorial Park were donated to the city by Francisca Luck, the daughter of Mr. Carl Martin Luck, when she passed away in 1974. She stipulated in her will that the property be used for a library, museum, and park complex in honor of the memory of her father, who operated a gas station there. Today, the renovated gas station is the museum. Every holiday season for the past 30-some years, the city puts up its beautifully hand painted wooden icons along Third Street, the city's main street. Restored in 2010 by local artists, the icons honor the saints for which the California missions were named. 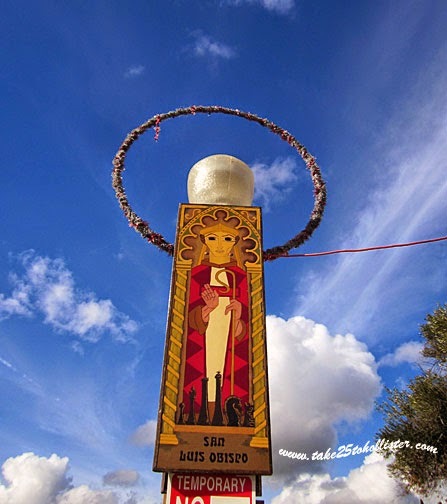 Along with its history, San Juan Bautista offers visitors a richness in art and theater -- El Teatro Campesiño is based here, as well as a variety of shops and restaurants to enjoy. 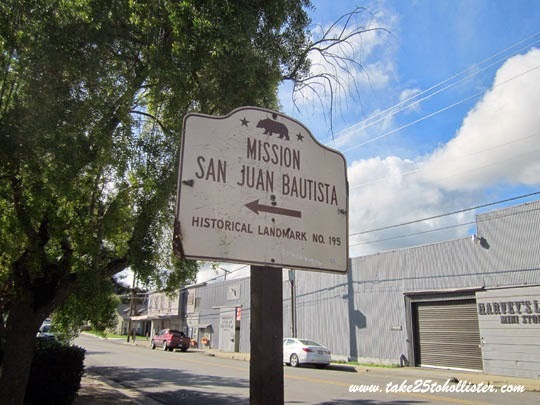 To start your exploration, check out this online guide of San Juan Bautista. Today, I'm linking up at Our World Tuesday. To see what's going on in other parts of the world, please click here. This sign in the Hollister Cleaners window cracks me up. 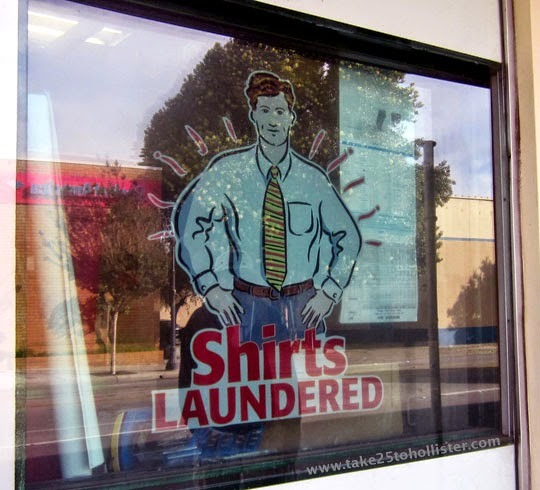 I haven't had any need for dry cleaning service in a long while, but if the Husband's shirts ever get drenched in stinky sweat, I'll be sure to try this business. Today, I'm linking up at the meme Signs, Signs. 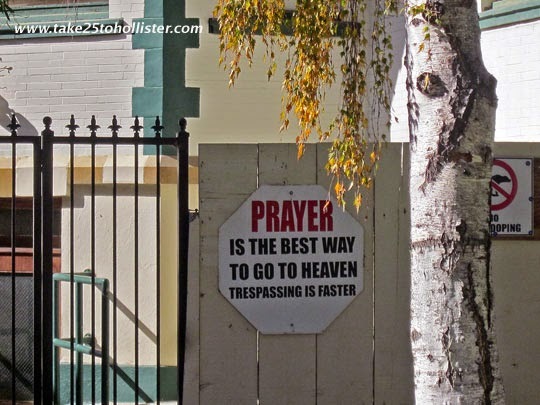 Come check out other interesting signs in the world by clicking here. I sighted this sign at the site of the original Hazel Hawkins Hospital on Monterey Street in historical downtown Hollister. I'm hooking up at Signs, Signs today. 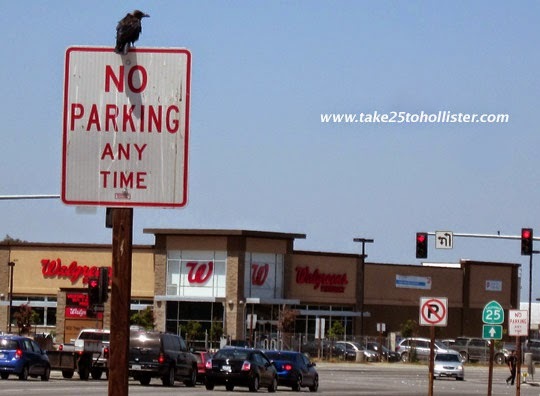 Come check out signs from other parts of the world by clicking here. 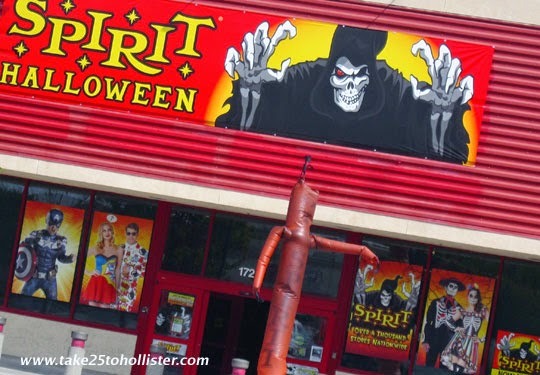 A Spirit Halloween has set up in the once-upon-a-time Staples building on Airline Highway (aka Highway 25). I understand it's a seasonal store, selling all things fun to those who celebrate the Great Pumpkin Day. Muahahaha. . . .